Polenta is one of the most versatile starches a chef can have on hand. Served soft, a well-herbed polenta can make the eyes of even the most sophisticated diner roll up in his head. Served firm, its crunchy browned goodness adds a handsome visual accent to any entree. Here’s a good basic recipe to get you started. Spray a large saucepan with cooking spray; heat over medium heat until hot. Saute the onions, garlic and basil until tender, about 5 minutes. Add broth and heat to a gentle boil; gradually stir in cornmeal and salt. Cook over low heat, stirring constantly, until thickened, about ten minutes. Pour the polenta into a lightly greases 8″ cake pan; cool to room temperature. Chill, lightly covered until polenta is firm, 3-5 hours. Spray a large, non-stick skillet with cooking spray; heat over medium heat until hot. Cut polenta into wedges; cook in skillet over medium heat until browned, 3-4 minutes each side. Serve. 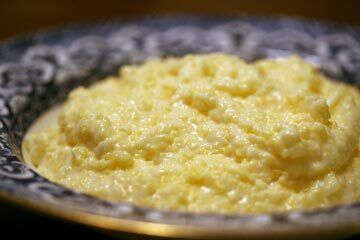 Options: to prepare a savory, soft version, cook the corn meal in a mixture of water and milk instead of stock (some heavy cream added here can’t hurt). Whisk constantly for 3-4 minutes to prevent lumps, then partially cover and simmer for about 45 minutes, whisking every 10 minutes or so. At this point, whisk in some creme fraiche and a handful of good-quality Parmesan cheese, adjusting the consistency with water or milk. Another option would to be pour your prepared polenta into a cylindrical container, such as one of those plastic containers we all have stored away (tip: taller is better than wider here) and chill overnight. Fire up your grill, grill pan or George Foreman appliance, remove the polenta from the container and cut into 3/4-1″ thick. Brush your grill with oil and grill the slices 2-3 minutes each side, until hot and well marked. Wait until you see how great this looks on your plate!